Fun ideas for a Despicable Me Party! 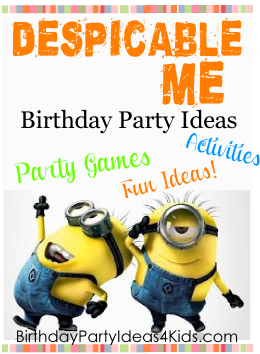 Despicable Me theme party games, activities, icebreakers, party food ideas and fun ideas for decorations and invitations! Blow up yellow balloons and attach printouts of minion’s glasses. Use a sharpie to give your minions a mouth and hair. Gluing googly eyes onto yellow cups makes minion cups! Use a sharpie to give them hair, a mouth, and other characteristics. If you do this on sturdy plastic cups, the guests can take them home as a fun party favor! A yellow and blue tablecloth can transform your front door and get guests excited before they even enter! Cover the top 2/3 of your front door with a yellow tablecloth, and the bottom 1/3 with the blue. Using black construction paper, cut out a mouth, a strap for the goggles, and the blacks of the eyes. Use white construction paper cut into a circle for the outside of the eyes. Glue these onto the yellow tablecloth, and you have yourself a giant minion! Make sure you cut out a slit for the doorknob so that guests can enter. Post some funny guest rules for everyone to follow! In the first movie, Gru tells the girls that there will be no crying, whining, laughing, giggling, sneezing, burping, farting, or making annoying sounds. Print these rules out and paste them around the party. For a creative backdrop, tape up a blue or yellow tablecloth to the wall. Blow up balloons in opposite color of the tablecloth and attach them in a line at the top of the tablecloth. Next, take blue and yellow streamers and hang them down from the balloons, in alternating order. Twist each streamers and secure them at the bottom of the backdrop. This works well for the food station, present station, or for photos. Buy cheap yellow construction hats and add a large Minion googly eye on the front for a fun party hat that can double for a party favor for guests to take home. Use blue and yellow paper to make a minion on the front, complete with googly eyes! Write all of the party information on the back. On the front of the invitation, write all of Gru’s rules for the girls in the first movie (no crying, whining, laughing, giggling, sneezing, burping, farting, or making annoying sounds) and write all of the information on the back. Play rounds of freeze dance. Have all the kids dance to music, but whenever the music stops the kids have to freeze. Any kid that doesn’t freeze gets (pretend) blasted by a freeze ray and is out. Last kid still dancing wins! Decorate eggs to look like minions. Have the guests pair off with a partner. Each pair takes turns tossing their minion to their partner. After each successful toss, both partners take a step backwards. The last team left tossing their minion wins! Have all of the participants stand in a line. One by one, each of them much make the most annoying sounds that he/she can (much like Agnes in the movie). If you have family/friends/other parents present at the party, have some of them guest judge and decide who makes the most annoying sound! This is the Despicable Me version of Simon Says! Tell all the kids that you are Gru and they are minions. Give them a simple command by telling them “Gru says…. (pat your head, hop on one foot, rub your stomach, sit down, etc.). They can only follow the command IF you say “Gru says”. If you give them a command but do not say “Gru says”, any kid that follows the command is out. Continue playing until you only have one kid left. Draw a minion onto a large posterboard or create one with colored paper. Print several sets of minion goggles off of the internet and cut them out. One at a time, blindfold each child and give them a set of goggles. The child then tries to pin the goggles on the minion where they are supposed to go. The child that gets the closest wins! Cut a large rectangle into the side of a large box. Label the box the ‘Box of Shame’ and have each guest take a picture inside before entering the party. Hide white ping pong balls around the party area. Have the kids search and find all of the ‘shrunken moons’. Set up a ‘create your own minion’ station. Supply kids with minion bodies cut out of yellow paper, blue paper for the pants, googly eyes, markers, glue, and anything else you can think to use as decoration (feathers, beads, pompoms, etc.) This doubles as a party favor! Make a yellow and blue candy bar. Put items like yellow and blue M&Ms, gumballs, sixlets, and jellybeans into decorative jars. This can double as a party favor when the guests leave! Make cupcakes with yellow and blue frosting to fit in with your color scheme. Designate white cake balls as ‘shrunken moons’, juice/lemonade/punch as ‘anti-gravity serum’, cotton candy as ‘unicorn fur’, and chips and salsa or a taco bar as El Macho’s salsa or taco bar. Make puppy chow, but stir in yellow and blue M&Ms to make a minion mix! This could also be done with regular chex mix. Make minions out of Twinkies! Use blue frosting for the clothing, black for the goggles, and white for the eyes. These are sure to be a big hit! Give the guests a small orange water gun to represent the shrink ray in the movie and a bottle of bubbles as anti-gravity serum. Use Despicable Me Band-Aids, stickers, and pencils as easy party favors. Glue printouts of Minion glasses onto yellow gift bags for an easy goody bag! Print out or hand write a card that says ‘thanks a minion!’ and attach to blue or yellow gift bags. If you have a projector, you could show one of the Despicable Me movies either in the background of the party or as one of the activities. See more ideas from our Despicable Me Pinterest Board!